I recently had the opportunity to photograph the Australian Gymnastics Championships at Hisense Arena in Melbourne. I have shot a lot of basketball and netball over the last 5 years, but the chance to photograph gymnastics was something new. It is refreshing to shoot something new, like I posted about in Fresh Perspectives on My Hometown. Before the championships I studied gymnastics photos, and then had a great time at the event. I learned a lot about gymnastics photography too. I have 10 lessons which I will share over two posts. So first, here are 5 lessons from photographing gymnastics. As this was the Australian national championships the standard was very high. The athletes have typically spent 10 years or more training to achieve this level. That means they are great athletes able to execute difficult gymnastics skills. I’m not sure why that surprised me (!) but the gymnasts had a tremendous combination of strength, flexibility and balance. That lead to a range of unique images which aren’t present in other sports. You’ll see examples in the images on this post. Like in any indoor sport relying on artificial light, the level of lighting can be problematic for a photographer. I was fortunate that this venue is a world class venue with good lighting. That said, because the action was fast moving, I was still shooting with ISO between 1000 and 2000 to keep shutter speeds at 1/1600s or faster. I was fortunate to be guided by one of the athlete’s families about gymnastics images. These athletes have typically competed in a range of state and national championships most of which have photographers covering the event. Those photographers typically focus on the actual competition. Lesson 3 from my 5 lessons from photographing gymnastics was not to overlook the warm up. It is a key part of the event for gymnasts and is rarely covered by photographers. Look for opportunities to shoot the warm up as well as the competition. Lesson 4 is obvious to gymnastics experts! The action is very fast moving. I have shot a lot of basketball in poorly lit stadiums, but I hadn’t appreciated that the action in gymnastics would be much faster than a typical basketball game. While a basketball game might have fast and slow elements to the game, there really aren’t any slower tempo parts to gymnastics. There is plenty of time preparing, but once the athlete is going it is very quick. To freeze that action you need equipment which will let you focus quickly and shoot at fast shutter speeds. I mainly shot at f2.8 to keep shutter speeds above 1/1600s. Prepare your equipment with the fast speed in mind. I was covering the women’s artistic gymnastics competition. That involves 4 different apparatus – the vault, uneven bars, beam, and floor routine. Within all of those, a gymnast has the opportunity to both execute the skills and express their personality. That said, it is the floor routine where they have the greatest opportunity to express themselves. How does this impact images you’ll shoot? Extensive planning has gone into all elements of the floor routine, so gymnasts are just as interested in the expressive poses as they are in the spectacular leaps. Don’t overlook these moments to capture images which are unique to that gymnast. Thanks for reading 5 lessons from photographing gymnastics. I’ll follow up with 5 more tips in a separate post. Just before I wrap up this post, if you are a photographer in Australia look out for the national championships dates and venue on the Gymnastics Australia website. It was an excellent event which I would recommend to other photographers. Thanks again for reading 5 lessons from photographing gymnastics. Happy shooting! This entry was posted in Photography Tips, Sports and tagged gymnastics, sports, sports photography on June 10, 2018 by Craig Dingle. Over the last 2 months I have been working with 5 other photographers to build a new image library. I didn’t know the photographers before we started the project, and it has been fun and challenging to work with them. One area that has become clear is that there is room for improvement in shooting moving objects. I have ‘grown up’ shooting sports and wildlife and selling prints. In that environment the images have to be in sharp focus. The 5 photographers are all younger than me and have ‘grown up’ in the era of Facebook and Instagram where there is less importance on fundamentals like having the image in really sharp focus. So here are a few pointers for shooting moving objects. Below is a straightforward lifestyle image of a woman walking across the road. This image can be very boring if she is standing still. Having her moving adds an energy to the image. So how do we maximize the chance of having her in sharp focus? Firstly we shoot in continuous focusing mode. I use Canon equipment, so on my Canon camera bodies that is AI Servo mode. Choose a single focus point to tell your camera where the focus should be. In this case I pre-selected this point before we walked across the road, and I aimed it at the model’s eye closest to the camera. For the shot above I wanted to blur the people in the background so I shot at f2.8. It was an overcast but bright morning, so I used ISO400. I knew at this ISO and f2.8 it would mean I could keep a fast shutter speed which again helps keep sharp focus in the image. The shutter speed in this image was 1/1600s. In older DSLR bodies I would be very careful about raising the ISO as it would result in grain in the image. But with modern DSLR’s this is not a concern, and is not a consideration at ISO400. What Shutter Speeds Should You Work With? The answer to this question is to practice extensively. I know from taking thousands of images of moving objects what shutter speeds maximize the chance of a sharply focused image. Of course the speed the object is moving has an impact on what shutter speed you will need. Again, from experience, I know that in the case of the image above any shutter speed at 1/400s or faster will give me a good chance of a sharply focused image. In the case of kids sport – I have shot many basketball games and know that 1/800s might not give me sharply focused images when the kids are running at full speed. At 1/1000s or faster I have a much better chance. And for fast moving wildlife like the grey headed flying fox below, I’ll be aiming to shoot at 1/1600s or faster. Shoot A Single Frame or Multiple Frames? Like everything in photography (!) the answer is up to you. I like to shoot multiple images to give me choice among the images and as ‘insurance’ if one shot is out of focus. I shoot images of fast moving objects in burst mode and shoot 3 or 4 images each time. This image was shot at 1/2000s to freeze the action of this fast moving flying fox. It was shot in burst mode. If you are serious about your photography and committed to producing sharply focused images you’ll need to master shooting moving objects. Think for a moment about the possible scenarios – sports, live music, lifestyle portraits, stock, wildlife, wedding, events. The list goes on. If you can’t shoot moving objects well you are going to significantly reduce the options for earning money from your photography work. I hope these quick pointers will help you with shooting moving objects. Next step – lots of practice! Happy shooting. This entry was posted in Sports, Stock Photography, Wildlife and tagged event photography, sports, stock photography, wedding photography, wildlife photography on January 11, 2018 by Craig Dingle. Making the step from working with friends and family, to photographing clients, through to working with models are big steps in a photographers career. They are also challenging steps unless you have a network of appropriate people to shoot with. This post – How to Find Models to Work With – details ways for you to source models for your shoot. Facebook. If you are a Facebook user and live in a place with a reasonable population, there is likely to already be a Facebook group set up which will help you. As I’m writing this post I’ve gone to the Facebook search field and entered “Sydney models” and it has proposed a series of relevant groups. As I scan down them I can see one called ‘Sydney Models / Photographers / HMUA’ which currently has 3716 members. So what is this? It is a group of models, photographers, and hair and make up artists (HMUA) who participate together in the group. They make requests for relevant services, share work, put forward their name for shoots, and use the Facebook group as a place to find other creatives to work with. Specialist Sites. There are also specialist web sites which create communities of creatives. The two that I am most familiar with are Model Mayhem and StarNow. Go ahead and check them out. It is free to set up a profile on each of them, and like the Facebook groups, they are a place for creatives to come together. How should a photographer use these communities? Start by setting up a profile and include details of what you are looking for from people visiting your profile. I am a stock photographer, so my profile includes details to let people know the projects I am working on, and the type of creatives I would like to contact me. Secondly, there is the opportunity to share your work. Add images to your profile so visitors can assess the style and quality of your work. Thirdly, each of these communities have the ability to post a ‘casting call’. That is, you put forward details of your shoot, and ask people who are interested to get in contact with you. where is the shoot? Be specific. A suburb is better than just the city name. how long do you anticipate the shoot will go for? is it indoor or outdoor? Studio or natural light? is the shoot paid or TFP (time for print, or time for portfolio)? what is the shoot concept? who is doing hair and makeup? A HMUA? or do you want the model to do their own? If you were not sure how to find models to work with, I hope this post has helped you. If you already use these sites or others, what is your experience? Which sites generate the best response for you? Thanks for reading – how to find models to shoot with. Happy shooting. This entry was posted in Business Tips, Portraits, Sports, Stock Photography and tagged microstock photography, model, Model Mayhem, models, portrait photography, portrait photography tips, Star Now, stock photography on January 16, 2016 by Craig Dingle. Freezing motion is a photographic technique to capture what the human eye cannot see. It is particularly effective in wildlife and sports photography. So what do we need to do to freeze motion, and how can we use this? To be effective in freezing motion we need to use a fast shutter speed. To achieve this we may need to use a high ISO depending on the lighting conditions. How fast does the shutter speed need to be? That depends on how quickly the subject is moving. Let’s look at some examples of freezing motion. In this case the player has just set off from a standing start. For this shot 1/500s has been fast enough to freeze the action. If he was running full speed we would need a shutter speed of 1/1000s or faster to freeze the motion. Example two is a black swan. This image was taken at Albert Park Lake in Melbourne, Australia. The outdoor setting and brighter lighting means we can use lower ISO, though we still need fast shutter speeds to freeze the action. In this case the settings were ISO100, 1/1600s, f2.8. The bright sunny conditions means I have been able to use ISO100 and 1/1600s to freeze the action. Smaller, faster wildlife will require fast shutter speeds than these. To achieve focus, I have selected a single focus point and focused on the swan’s head. In the sports examples, I have used the same technique. Choose a single focus point and focus on the player’s head. 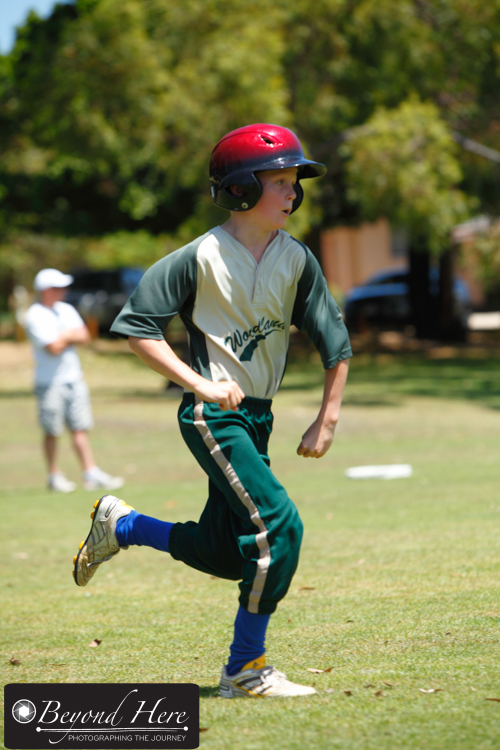 In example three we have a player running towards first base. The brightly lit outdoor conditions mean we can achieve fast shutter speeds with lower ISO’s. In this case the ISO is 200 and the settings 1/1000s and f4.5. Again, for faster moving subjects, higher shutter speeds will be required. How might we use the techniques for freezing motion? The sports examples show you that action images are no longer reserved only for professional sports people. With today’s camera technology and these techniques it is possible to create action portraits in local, amateur sports too. For success in freezing motion, keep your shutter speeds high, and use a single focus point. 1/500s will work successfully for larger, slower moving subjects – and 1/1600s and faster for smaller faster moving subjects. 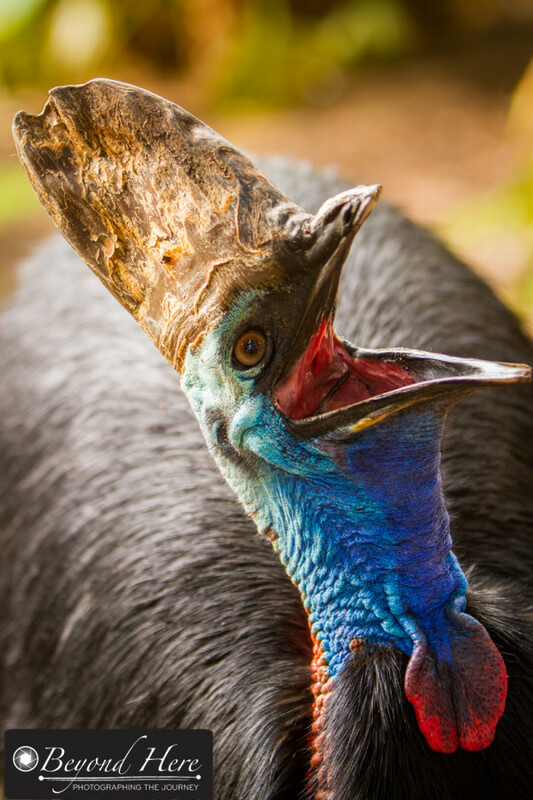 This entry was posted in Photography Tips, Sports, Wildlife and tagged baseball, basketball, black swan, cassowary, freezing action, freezing motion, photography, photography tips, sports, swan, wildlife on July 9, 2014 by Craig Dingle.